Cold Freedom—Troon Harrison | Moonshell Books, Inc.
Book 3 in the Historical Horses series. A novel of 68,000 words, edited by Moonshell Books in March 2017. A teenage girl and her beautiful purebred horse; the coldest winter of the twentieth century; a brutal invading army; and refugees fleeing for their lives. Can love be the only thing that saves them? A black Trakehner mare named Carina saved Eva’s life when she was young. 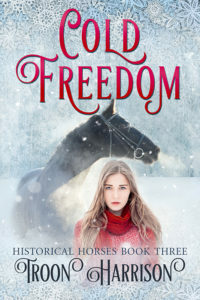 Now Eva, daughter of a Prussian cavalry officer, needs to save her mare’s life—if she can. It’s 1945 and Eva, her family, and the horses join the refugees struggling across northern Europe, fleeing the advance of the Red Army. The horses walk carrying unborn foals, their shoes falling off, their legs injured, their bellies empty. Eva doesn’t know what they will face on their epic trek. Can she keep her promise to Carina that one day she will run in green pastures, and her foals will be champions? This dream is practically all that helps Eva face the unbelievable hardship along hundreds of miles of icy roads. Through it all, she is determined not to be parted from her black mare. Based on true events, this novel traces the history of Trakehner horses. Internationally famous in dressage and jumping, they walked out of Prussia during WWII in an incredible feat of endurance. This entry was posted in Historical, Young adult. Bookmark the permalink.